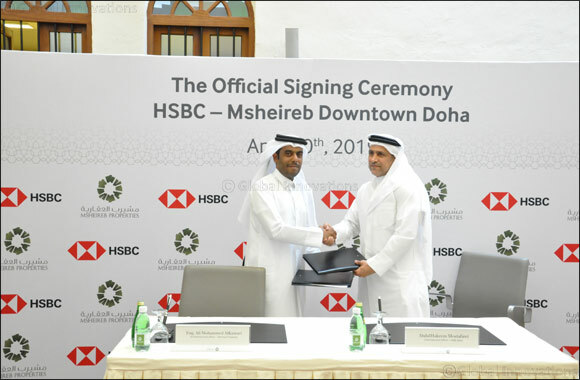 Doha, Qatar, 13 April 2019: Msheireb Downtown Doha, the smartest and most sustainable fully-built city district in the world and Qatar’s destination for leisure, living and business, will be home to the first HSBC digital branch in the country; HSBC Msheireb. The announcement was made during an agreement signing ceremony between Msheireb Properties, the national real estate developer and a subsidiary of Qatar Foundation, and HSBC Bank Middle East, Qatar, the largest international banking organisation in the country. The event was witnessed by the Lord Mayor of London, Peter Esilin, the higher management of Qatar Financial Centre and the UK Embassy in Qatar. Set to open in October 2019, HSBC’s new digital bank is the first of its kind for the group and the fourth retail branch in Qatar. HSBC Msheireb will be implementing a series of digital services to make customers’ banking journey smoother and more convenient. “The new district of Msheireb will be a showcase of the future of financial services and HSBC’s branch there will be a focal point for the delivery of innovative digital banking services as we begin a new phase of our development in Qatar. Commenting on the agreement, Mr Ali Al-Kuwari, Acting CEO of Msheireb Properties, said: “We are committed to revive Msheireb’s earlier status as the capital’s trade and business hub, by bringing in services and experiences that are SMART, sustainable, innovative and fit for the future of Qatar. HSBC has been operating in Qatar since 1954. The bank currently has three branches operating in Doha including Airport Road, City Center and Salwa Road as well as a network of ATMs in 10 different locations.